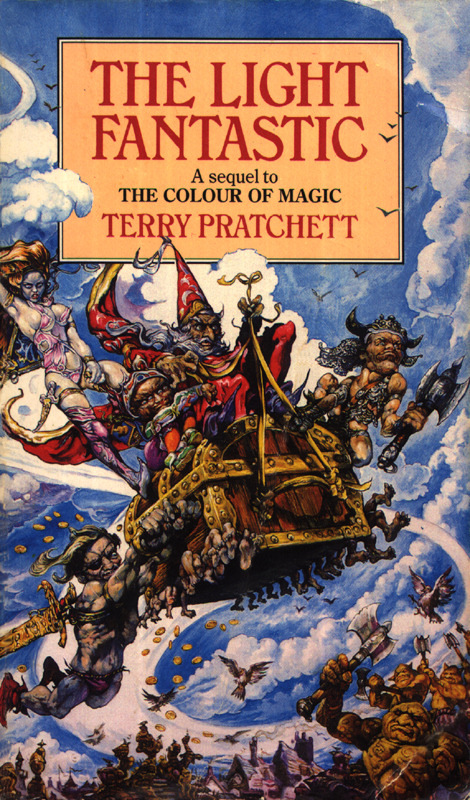 when I was young and my older brother was reading Terry Pratchett, and my younger brother was about to start reading Terry Pratchett, his books still had those dizzying, vulgar (I’m not sure whether I mean that in a positive or negative sense, but I’m sure that’s the right word) covers. I thought for years that his books must be a surreal and adult romp through some incomprehensible world. Not all of that impression was wrong, but having now read almost every Discworld book, I know that not much of it was right. I’m reading his second-to-latest book at the mo, Unseen Academicals, and it’s coming home to me all over again, just how well he writes characters. Specifically, characters who are pretending to be something they’re not – or pretending not to be what they are. His characters are complex. They are unreliable narrators, because they’re not always honest with themselves about who (or what) they really are. Their motivations are not what they appear to be. Or else they have two opposing motivations, and you never know which one will out. It’s nature v nurture battling it out inside one consciousness. It creates narrative traction like nobody’s business, because whilst you’re following the bigger-picture narrative and trying to figure that out, you’re also working away in the back of your mind on what this character is hiding from you. It never feels coy, because they’re almost always hiding it from themselves, too. Very often, when the conflicting parts of a character come to a head, there’s a moment where free will determines the outcome of this one struggle, which most likely determines the outcome of a larger struggle. A character’s own nature sets the stage and writes the drama for their own moment of epiphany. The next thing is figuring out how the hell he does it. This entry was posted in on writing, review and tagged characterisation, discworld, michael caine, terry pratchett, unseen academicals, writing, writing character by Anna Cowan. One very hot evening in 2007, special k and I went to a free concert on the banks of the Hudson River, just up from Ground Zero. We saw some people play who were not too shabby, and then Martha Wainwright played a solo set, just she and her guitar. It was magical. Then I decided to go up to the stage and join the smallish crowd waiting to meet her. She wasn’t very nice, or communicative – and in her defence, she had just flown direct from a particularly muddy Glastonbury festival. I don’t even care that she wasn’t nice, it really has nothing to do with me. I just took this from it, as I had three years earlier when i met Sime Nugent: Don’t Meet Your Heroes!!! It’s his books I love, not him. I can keep loving them, and getting everything I get, without ever coming into contact with him. Ditto Martha. It’s her music I love, and who she is doesn’t enter into that. The desire to know everything about these people is insidious though. (Er, yes. See the entire tabloid industry.) As I said yesterday, I’ve fallen in love with Matt Smith’s Doctor Who. Not to be confused with falling in love with Matt Smith. Because as soon as I see photos of him, the man, the actor, it diminishes who he is on screen. It adds another layer to it, that has nothing to do with it. He isn’t written, in real life. So next time you feel that need to know more, which is so easily fed by google and the like, just pause for a moment to consider what you really love. This entry was posted in rant and tagged doctor who, martha wainwright, matt smith, sime nugent, terry pratchett by Anna Cowan.